The IWC Portofino Hand-Wound Monopusher was part of the new fleet of novelties introduced at this year’s edition of Watches & Wonders, the foremost exhibition of fine watchmaking in Asia. In terms of construction, the movement powering the Portofino Monopusher Chronograph belongs to the 59000 family of eight-day hand-wound movements that was first launched in 2011. The calibre 59000 faced considerable opposition when it was first being developed — the prevailing sentiment was that IWC, with its resolutely pragmatic and forward-looking approach, had no space in its stable of in-house movements for a manual-winding calibre. This would have been true if the cal. 59000 had been a simple hand-wound movement, but whole point of the cal. 59000 was that it had an eight-day power reserve. In many areas it outperforms a typical automatic movement with 48 hours of power. The cal. 59000 proved its worth in short order — the Portofino Hand-Wound quickly became one of the company’s most popular models, and more functions were planned for this robust, long-powered family. Among those who championed the cal. 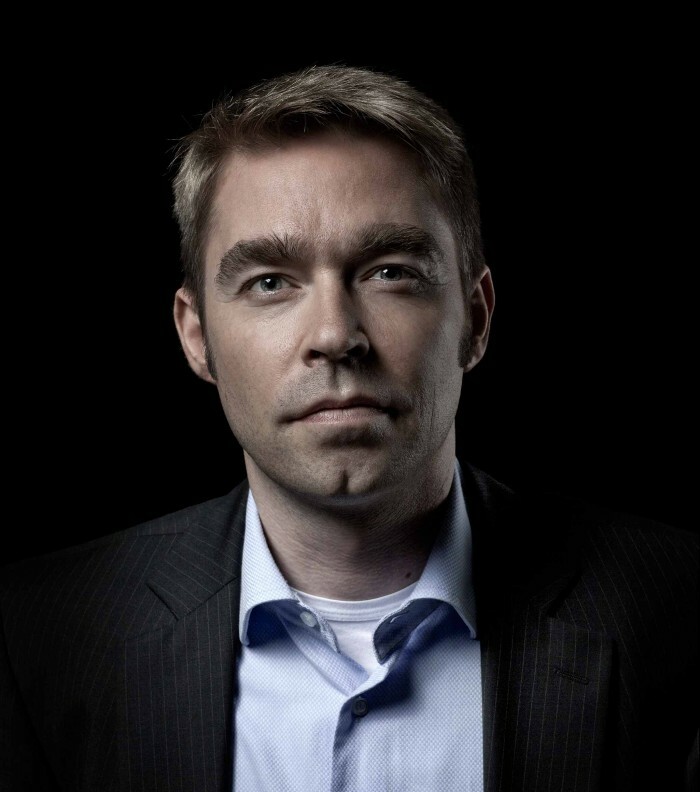 59000 and pushed hard for its development was Stefan Ihnen, who joined IWC in 2002 and has been associate director of R&D since 2010. Ihnen’s focus within the company now is strategic, but one of his earliest contributions to IWC was the automatic integrated chronograph cal. 89361, which has since become a part of IWC’s most prestigious watches, including the Perpetual Calendar Digital Date-Month in its various iterations. There’s no one better to take us through the various features of the new monopusher cal. 59360, so get yourself ready, because we’re going deep into technical country here. REVOLUTION: Can you tell us more about the decision to integrate a monopusher chronograph into the IWC catalogue, given the company’s ongoing product emphasis on modern-looking industrial solutions? After all, a monopusher chrono is very traditional. Stefan Ihnen: The monopusher chronograph is indeed a very traditional complication, just like a tourbillon or a perpetual calendar, both of which we also have in our portfolio and are quite successful. 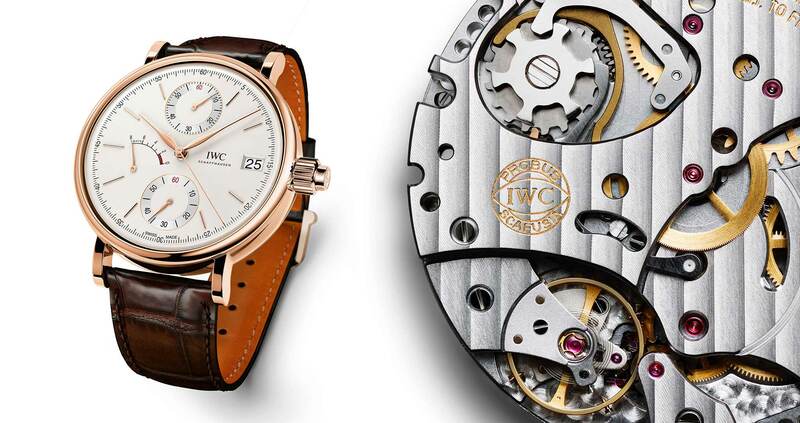 We mustn’t forget that IWC is all about combining 150 years of savoir-faire and advanced technical engineering. Therefore, we thought the monopusher would be a very good addition to our collection. We decided to manufacture our monopusher with a different and more modern touch: there is a technical look to the movement with a frequency of 4Hz (28,800vph), a modern balance with an indexless regulation system, eight days of power reserve, a power-reserve indication and a 60-minute counter. Tell me about the chronograph coupling mechanism in the cal. 59360 — I see something that appears to be a rocking pinion, which is a really reliable and robust alternative to the classical lateral clutch wheel. I really admire the hybrid clutch system of the cal. 89361, which has both friction clutch for the seconds and lateral clutch from the barrel for the others. Was it impractical to incorporate a friction clutch in the 59360? 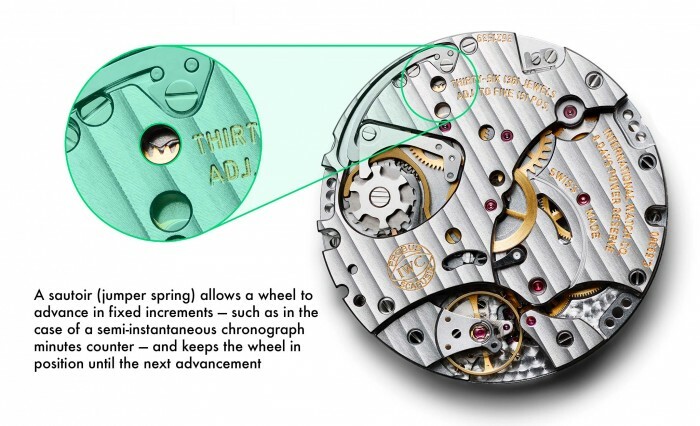 The coupling mechanism of the monopusher is technically similar to the one featured in the chronograph seconds of the cal. 89361. A full hybrid system like the one in the 89361 was not useful for the monopusher for two reasons: firstly, there is no hour counter, and a minute counter connected with the seconds counter was a very robust as well as a simple solution. Secondly, in contrast to the cal. 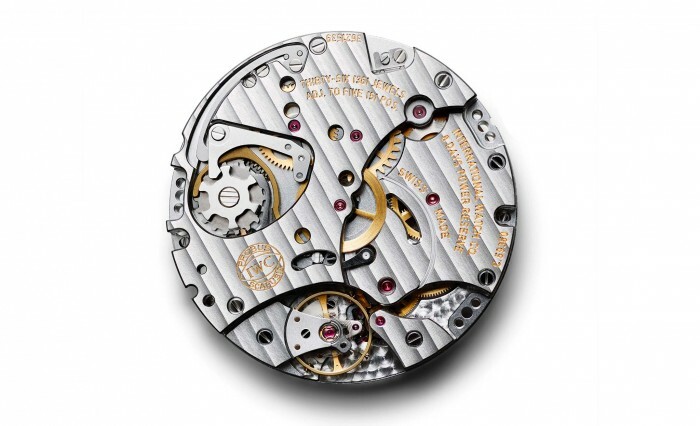 89361, which has a fully integrated chronograph mechanism, the architecture of the cal. 59360 comprises a module on the movement side. Therefore, it was not possible to integrate an interface with the barrel, and the best way was to couple the chronograph mechanism (the chronograph center wheel) with the seconds wheel of the base movement with a rocking pinion. One of the best “insider’s knowledge” uses of the IWC chronograph cal. 89361 is that you could use the barrel-driven chronograph hours and minutes as a second time zone. Because of the sweep movement of these chrono indications, this was very easy to read and practical. Did you consider giving the cal. 59360 this feature? No, we did not. From the very beginning, the monopusher had a completely different concept: hand wound, high power reserve, no separate pushers, plain dial design. Again, we wanted a classic complication for a classic watch with an IWC twist of course: a great watch for connoisseurs. Actually I notice the sautoir holding one of the chronograph wheels. I didn’t get enough time with the watch to discover this, but is it a semi-instantaneous chronograph minute counter? Is this necessary to preserve the traditional feel that is associated with a monopusher? Yes, it’s a semi-instantaneous chronograph minute counter. 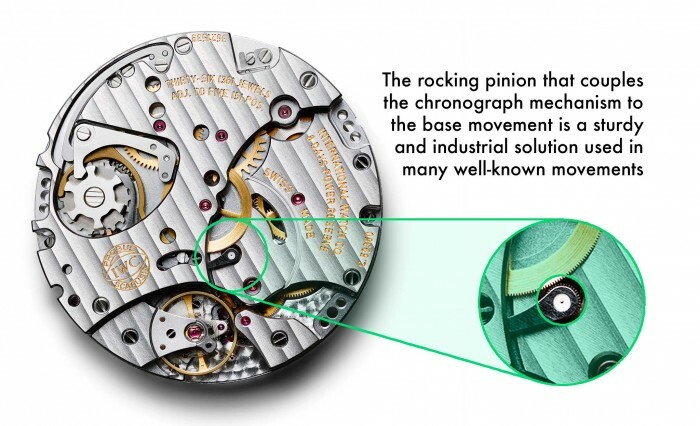 It’s a classical way for a chronograph minute wheel to be maintained in position. Within this kind of technical concept it’s absolutely necessary for a precise jump of the hand. The power reserve of the watch is actually longer than its name implies — the watch stops automatically after eight days have passed without winding. Is this to prevent the watch from running on low torque, which would compromise the chronometric performance of the movement? This is correct, indeed. All calibres of the 59 family feature more than eight days of power reserve. But after eight days, controlled via the differential of the power-reserve indication, there’s a lever activated which stops the balance automatically. This system helps secure a good precision within the power reserve, as it cuts off the bad end period before the torque of the barrel drops to zero. It’s a system similar to that of a hacking second, which stops the watch by touching the balance after exactly eight days. How does the small seconds hack? Is there a balance brake that activates when the crown is pulled out? Yes, there is a brake which stops the balance by touching the balance wheel when the crown is pulled out.